The teacher was barricaded in a classroom at Dalton High School, police said. A teacher at a Georgia high school was arrested today after he apparently barricaded himself in a classroom, police said. Police in Dalton, Georgia, responded to a report this afternoon of shots fired at Dalton High School. The Dalton Police Department warned parents via Twitter not to come to the school and said a suspect "believed to be a teacher" was "barricaded" in a classroom. Around 11:30 a.m., during the school's third-period class, some students were trying to get into the teacher's classroom, and the teacher would not let them inside, Dalton Police Department Spokesperson Bruce Frazier said at a press conference Wednesday afternoon. When the principal arrived at the classroom, the teacher forced the door closed and wouldn't let him in, Frazier said. The principal then used his key to enter the classroom and heard a gunshot go off once he was inside. The principal then placed the school on lockdown, Frazier said. Police arrived on the scene shortly after the lockdown and convinced the teacher to surrender and let them in about 30 to 45 minutes later, Frazier said. He was then taken into custody without incident. It is unclear what caused the incident, but the teacher had been instructing a class right before it started, according to Frazier. (@jordankirkland0/Twitter) Police wait outside Dalton High School in Dalton, Georgia, Feb. 28, 2018. At least one shot was fired out the window, Frazier said. The teacher -- identified as 53-year-old social studies teacher Jesse Randal Davidson -- has been charged with aggravated assault, carrying a weapon on school grounds, terroristic threats, reckless conduct, possession of a gun during the commission of a crime and disrupting a public school, according to police. He is currently being held at the Whitfield County Jail without bond, police said. Dalton High School Principal Steve Bartoo said that when he attempted to enter the classroom, Davidson made "nonsensical" noises "hollered" for him to go away, warning him that he had a gun. Bartoo said he placed the school on lockdown even before he heard the gunshot. The school's student resource officer had left campus momentarily to stop by the nearby middle school, Bartoo said. He came back to campus immediately after Bartoo called him and was instrumental in persuading the teacher to come out of the classroom, said Dalton Police Assistant Chief Cliff Cason. Bartoo described Davidson as a "good teacher" who is well thought of. 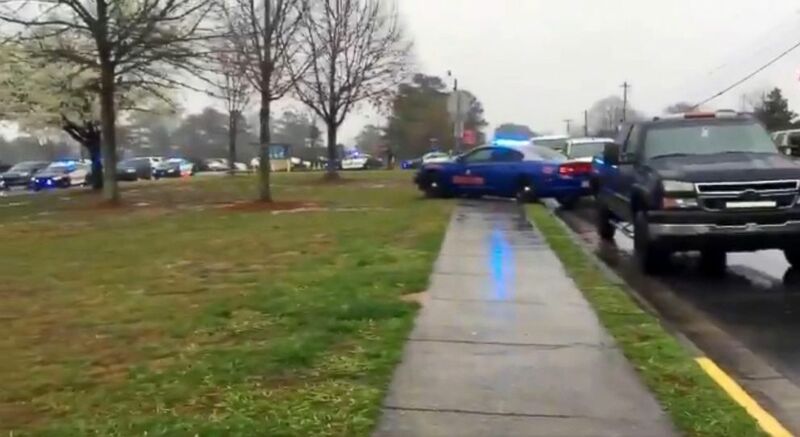 Video posted to social media show a heavy police presence outside of the school. Davidson has been a teacher at the school since 2004 and also calls plays for the football team, according to police. Students were evacuated from Dalton High School and taken to the Northwest Georgia Trade and Convention Center in Dalton, where police said parents should meet their children. Bartoo commended teachers, faculty and students for their "brave acts" and for following lockdown procedures "to a tee." "I can't tell you how proud I am of our kids," he said. One student apparently sustained an ankle injury while running inside the school during the evacuation. The student was treated on scene by first responders, police said. The school regularly practices threat lockdown drills, with the most recent one taking place earlier this semester, Bartoo said. Investigators are currently looking into how Davidson was able to bring the gun on campus. ABC News' Rachel Katz and Dominick Proto contributed to this report.